eat sleep cuddle. : veggie show & tell. + veggie noodle soup (see recipe below) with homemade blue potato chips. 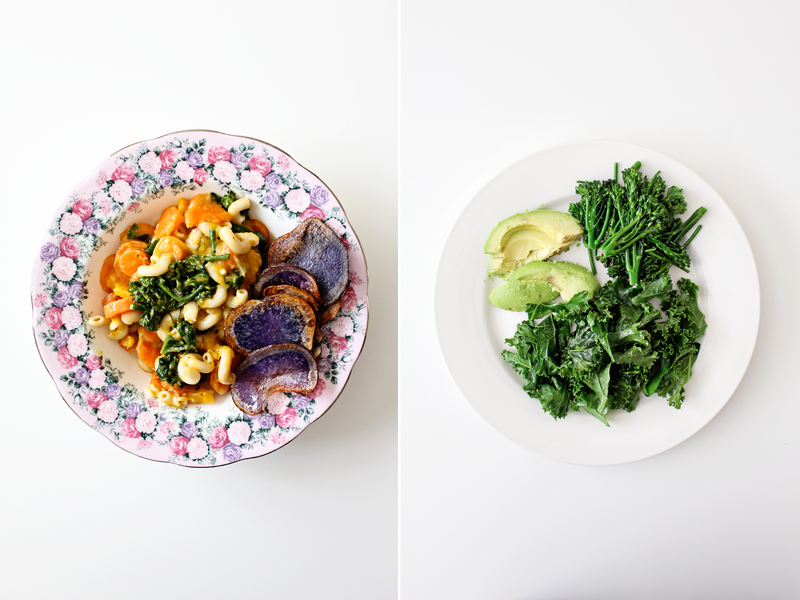 + sauteed broccolini & kale with avocado. + spaghetti squash with pan-roasted zucchini & cherry tomatoes. 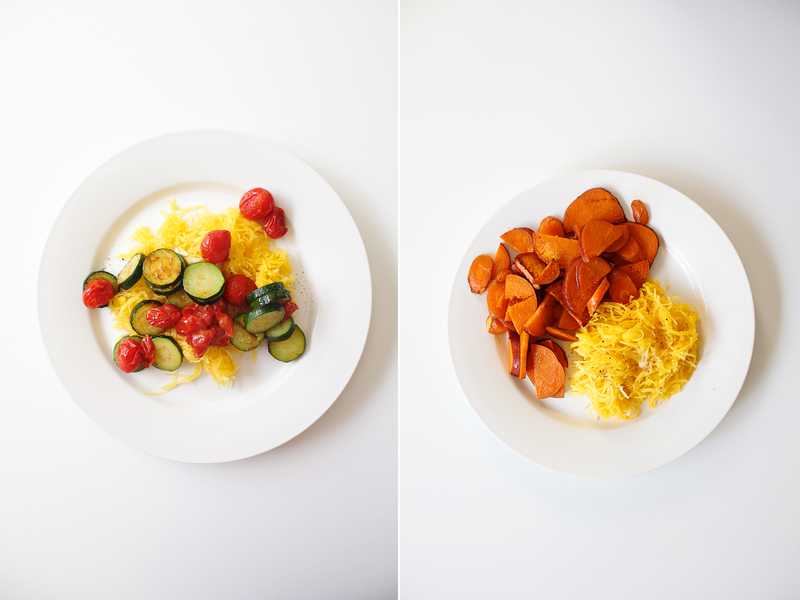 + spaghetti squash with pan-roasted carrots & yams. + raw shredded kale & brussels sprouts and avocado, tossed with fresh lemon juice, olive oil, salt & pepper. 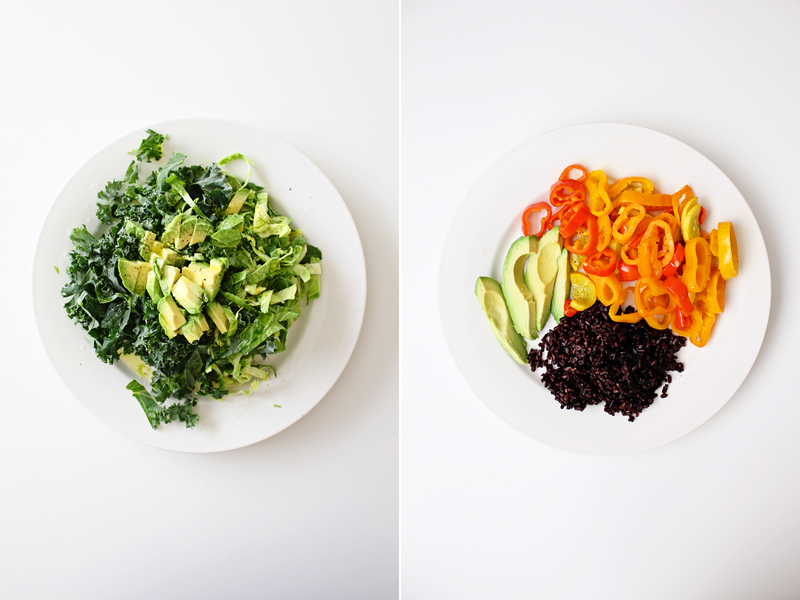 + pan-roasted mini peppers and yellow zucchini/squash with avocado and black rice. a few other things....my favorite way to cook and eat vegetables is just to throw a bunch of them in a pan with some olive oil, salt & pepper and cook them up. (quick and easy!) also, i still haven't given up my desserts and/or other yummy treats, so i haven't noticed any weight loss from eating all these veggies, but i have noticed that i have a lot more energy (i sleep about an hour or two less per night!) and so much more peace of mind when i eat this way. WHITNEY'S VEGGIE NOODLE SOUP "RECIPE"
2. once onions are translucent, pour in equal amounts of vegetable broth & water, and then add carrots, yams, butternut squash (or any vegetable you want!) and brown rice noodles. 3. let boil until noodles are soft (10-15 mins?). 3c. salt & pepper all along the way! i plan on making this for dinner tonight, and i am really looking forward to it! any other tips on how to eat more vegetables?? happy monday!